As most of us know there are an incredibly amount of messaging systems on the market. Each one tries to capture a niche market, with the king WhatsApp leading the pack. Recently, at a Thanksgiving dinner which I had the pleasure of attending, there were around ten people who were friends of the hostess. Among the many things discussed was privacy or lack-thereof in various apps and social networks. I personally do not even try in this day and age to fool myself into the thought that it is possible to preserve privacy, unless one actively seeks out a solution. During the ongoing discussion I was asked quite a few questions about apps and what I use. What I noticed fairly quickly is that if one is not in the technology field most people seem to use the apps they are given on their various phones while adding the basic needs such as Whatsapp, Skype & a couple of others. Not many people go app hunting nor do they find the need to do so. There is absolutely nothing wrong with this until one gets to the subject of work environments and use of the phone or tablet. Interestingly enough almost all were unhappy either their email apps (I will address this in a future article). It shocked me when I discovered the two people working for news agencies were passing business texts about upcoming news and alerts on basic SMS systems or Whatsapp. In my part of the world no one doubts or even questions the fact that every single one of these messages are being scanned by outside security forces. Actually during the most recent war with Gaza one commercial which was repeated on the radio every 15 minutes was to warn soldiers never to send information or pictures with WhatsApp or non-secure systems. So it was surprising for me to discover that news agencies were using basic non-secure systems to pass around sensitive data. Especially in the current environment, where Apple, Google and others are up against intense scrutiny for putting encryption into the basic core level of the Apple and Nexus products. This may not be great for the NSA, but for people and businesses needing security, encrypted messaging and email are essential. So much for IT departments! At the very beginning I must say that I love WhatsApp, so thus is not against using it. However for an individual or institution requiring a modicum of security in its messages between employees or reporters, using basic SMS or Whatsapp is foolish. In this article I am going to concentrate on "Telegram", one such basically secure app, which is totally free, and according to their own description, "Telegram is free and will always be free. We are not going to sell ads or introduce subscription fees. ", (no annoying advertisements is a big plus in my book). 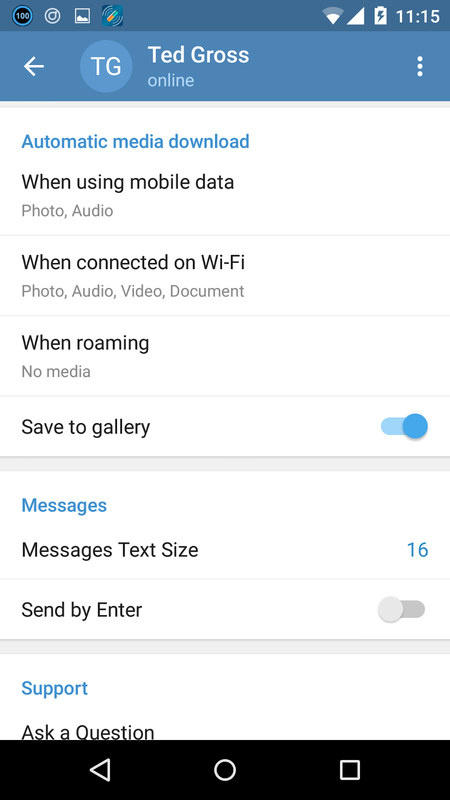 While it is rumored that WhatsApp is going to include encryption in 2015, Telegram already has it and does it with ease for the end-user. 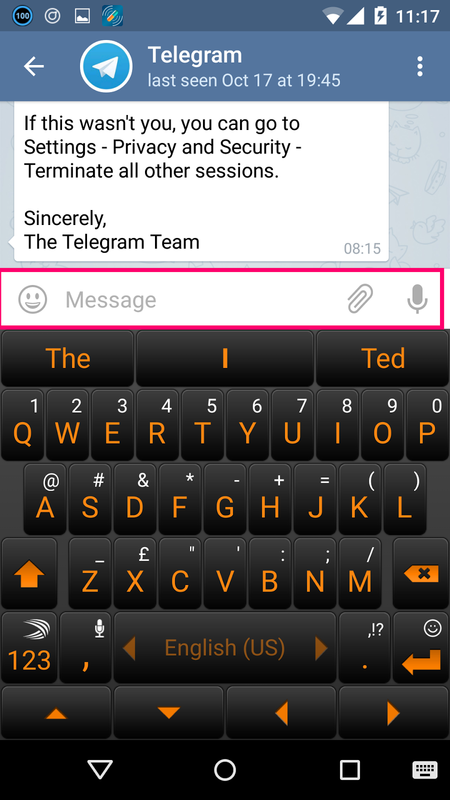 Telegram allows for the sending of not only text, but files, voice messages, video, images and emojis. Files can be in any basic format you desire and size is not an issue. This already puts it up in the category of the major players in the messaging field. Obviously the key word here is "secure". Telegram actually uses two types of security. The normal type of encryption used is client to server and server to client. This guarantees no one is sniffing out your texts and even if they do so they will only see gibberish without the decryption keys. The second possibility is what Telegram calls "Secret Chats". To keep this simple, it is a direct connection between the people involved in the conversation, and passes what is known as private keys. Secret Chat not only offers end-to-end encryption but the text, files, images or videos sent in such a conversation can be set to self-destruct, leaving behind no trace on the client phone or on the servers. One may suspect that all this encryption slows down message sending and receiving, however in my tests Telegram was just as fast as any other messaging system including WhatsApp. The encryption did not seem to slow anything down at all. Telegram also has all the other bells and whistles. 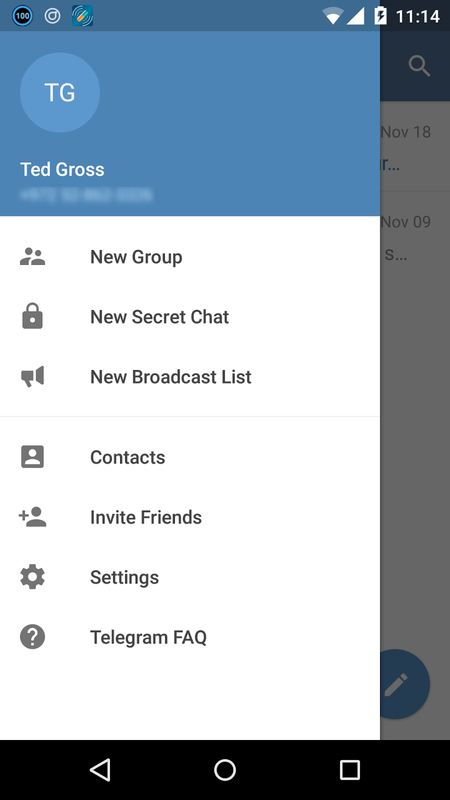 As you can see from the screen capture, it is possible to create groups (up to 200 people at a time), secret chats as defined above and broadcast lists (up to 100 people). All three are great options for private and business use. 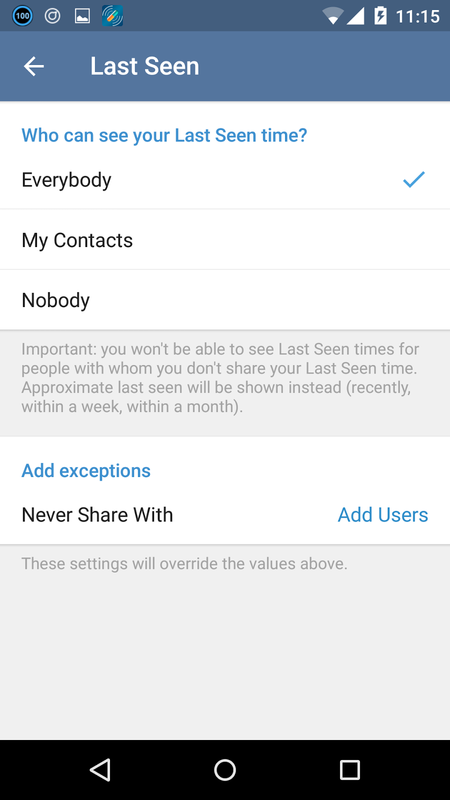 As in all other messaging systems, Telegram will, if you ask it to, search through your contacts to see who else you know may be on the system already. The other big plus with Telegram, as can be seen in the next screenshot. You do not need to pass your phone number to someone in order for them to contact you on the system. It works with phone numbers but also with user names. (Much like Skype). If someone has your chosen user name and both of you run Telegram, a secure conversation can be established with ease. 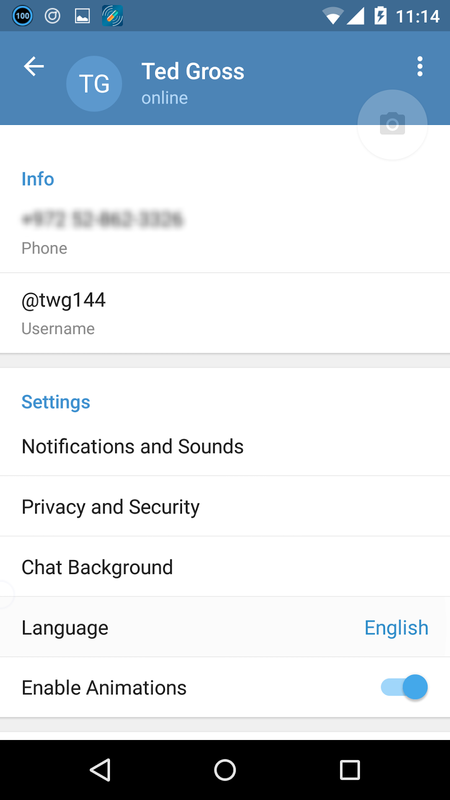 For instance my user name is @twg144 and in Telegram I can be contacted by using it. The advantages for this of people working with sources for information are abundantly clear. Additionally, as in most other good systems, if you receive messages from an unwanted source, it is very easy to block them.So giving my username out here is like giving out a twitter @name. As can also be seen from these screenshots Telegram does not ignore the smaller yet important abilities that should be part of any good messaging system. You have control over your notifications, when, how and where, as well as Language and animations. Chat backgrounds are included though I have never found much use for such things, except in using a dark or light theme (part of the new Lollipop "Material Design" specs). Privacy & Security are also part of Telegram, as they should be. 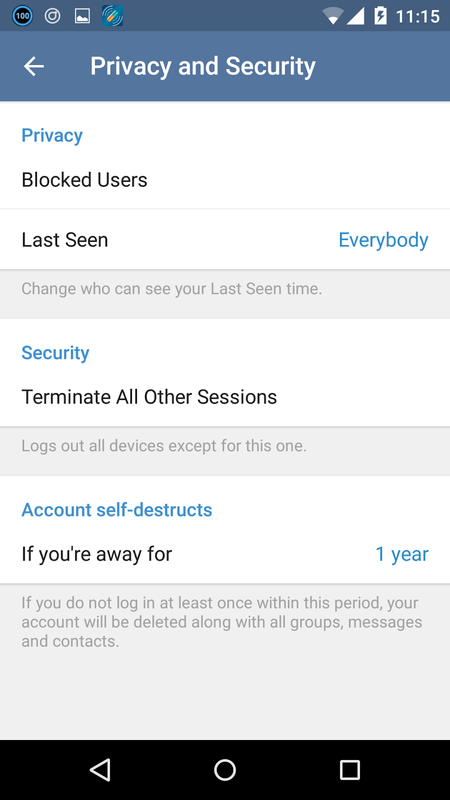 You can, as I mentioned above block users from your Telegram system, terminate any sessions, and set the time for when even your account self-destructs (not to be confused with self-destructing messages as in Secret Chats). These are all fairly interesting and important options. The level of security and privacy is in your hands. You can also hide your presence on-line and when you were last on line. These options all show a deep understanding of the messaging market, and concern users and businesses have over security. Telegram does not forget about the important incidentals as well. When to download audio, image, video and other sent files, and when to secure costs and wait to download until connected on WiFi. This of course depends on your cellular package, the size of the files, the required immediacy of seeing them. In conclusion, Telegram does live up to its claims. It is as fast as any other messaging system. It provides security on all levels, and introduces complete end-to-end encryption in Secret Chats, which can be programmed to self-destruct. It is cross-platform, allowing one to work on one device than switch over to another device without having to start all over or lose part of a conversation. It contains all the options of the big boys on the block, including emojis. It allows for the sending of files, audio, video, images and text. You can give out only your unique user-id and not a phone number for those interested in contacting you and you have no wish to give out a phone number. You can block users and or spam messages easily. It allows you to maintain as much control over your own privacy as is possible and keeps your messages encrypted and secure. It is free with no advertisements. If you are looking for security in your private life, or just the ability to take back some privacy, Telegram is an excellent option. If you are a business in need of secure messaging between employees and groups of employees, Telegram is not just an option it is a must have. No business should be without secure messaging these days. Since it is free, and very simple to install there is simply no reason not to use it. *Disclaimer The author of this article has no connection with Telegram, the company which created it or programming staff.